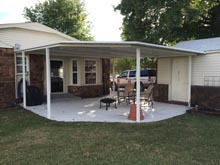 See descriptions of each type of RV Cover below, or click on the picture above. 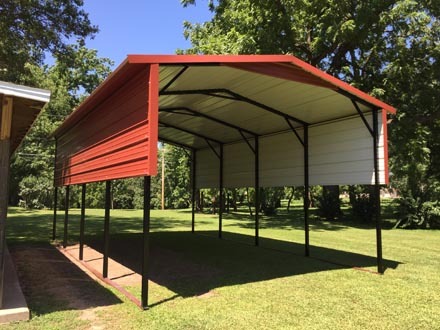 Our Standard RV Covers include 14 gauge 2 ½” square tubing for the framework and 29 gauge sheet metal in your choice of colors, and all necessary braces. 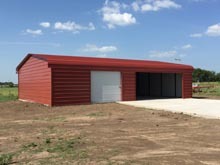 Prices include delivery and setup on your level or unleveled site (dirt, gravel, grass, concrete or asphalt) and the posts will be cut on site so your building is level and looks great! Any size available, call for pricing. Prices include one extra panel on each side for a coverage of about 4’ per side. 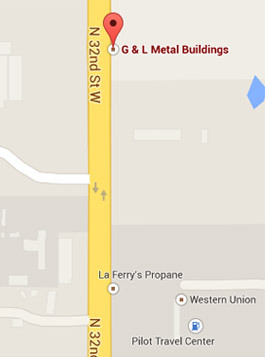 Extra panels for the use on the sides, back, or gable ends are available. Call for pricing. 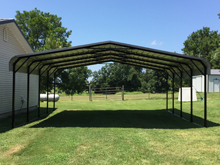 Our Boxed-Eave RV Covers include 14 gauge 2 ½” square tubing for the framework and 29 gauge sheet metal in your choice of colors, and all necessary braces. 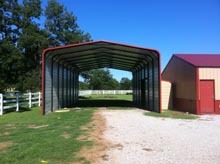 Unlike the Standard RV Covers, they are an A-frame style building with boxed in eaves. 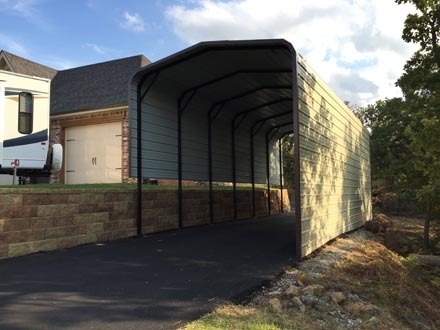 Prices include delivery and setup on your level or unleveled site (dirt, gravel, grass, concrete or asphalt) and the posts will be cut so your building is level and looks great! Prices include one panel on each side for a coverage of 3’ per side.